« Baltimore, Are You Not Entertained? After losing two of three to the Oakland Athletics at home last weekend, and facing what looked to be a bear of a road trip, things were looking a bit grim for our O’s. Instead though, the Birds managed to continue the road successes that have marked this surprising 2012 season by taking two of three from both the New York Yankees and Tampa Bay Rays. After the 4-2 road trip, the O’s now stand at 57-51, still six games over .500, and just 0.5 games out of the second Wild Card spot (and one full game out of the first) in the American League. The Orioles now have a record of 32-25 (a .561 winning percentage) away from OPACY in 2012, which is good for the best road record in the American League. Only the Washington Nationals (33-20) and Cincinnati Reds (30-22; .576) have better road records in MLB. To really remain contenders here over the season’s final two months though, Buck’s club needs to start figuring out how to win games in front of the home crowd. They are a very mediocre 25-26 in B’More, which is pulling down the old winning percentage. Fortunately, they are about to embark on a 10-game homestand against American League cellar-dwellers. First up is Seattle – the M’s are in last place in the AL West at 51-59; however, they’ve (of course) won eight of their last 10 coming into Baltimore. The good news is that the O’s will miss Mariners’ ace Felix Hernandez, who pitched on Saturday. Following the Mariners, the AL Central’s punching bags, the Kansas City Royals, come to town. KC’s 45-62 record is the worst in the American League. The O’s really need to win at least three of those four games. The home stand wraps up with three games against the Boston Red Sox, who are currently in fourth place in the AL East, just a half-game ahead of the Toronto Blue Jays. The Sox looked to be getting a little hot last week, only to go into Minnesota crap the bed at home over the weekend and lose three of four to the lowly Twins. The table is set very nicely for the O’s to turn around their home fortunes over the next week-and-a-half. That 25-26 home mark should absolutely be something like 32-29 after these next 10 games; if it’s not then the only conclusion to make is that the Birds let a golden opportunity slip away. While it won’t be detrimental to their postseason hopes as long as they can continue their stellar play on the road, anything less than a 6-4 homestand against this group of teams has to be considered a huge disappointment. Things aren’t exactly easy tonight, as Jason Vargas takes the hill for Seattle. Vargas is 12-7 with a 3.71 ERA, and has won his last five starts dating back to July 7. 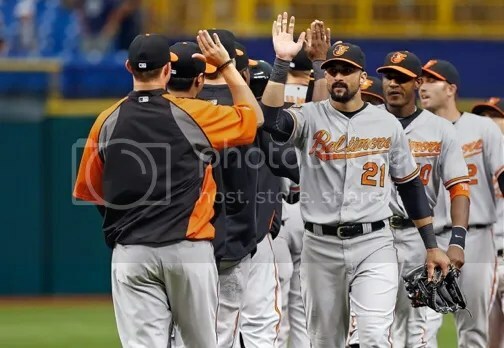 But hey, the O’s won on Sunday in Tampa in a game started by David Price, so they shouldn’t be intimidated. Chris Tillman (4-1, 2.70) takes the hill for the O’s, and he’s won his last three starts. As long as he can get through the first inning – which has been his bugaboo – he should definitely give the Birds a chance to win. Get out to the Yard and support your O’s, Baltimore. It’s time for some good ol’ home cookin’. This entry was posted on August 6, 2012 at 8:57 am and is filed under Orioles. You can follow any responses to this entry through the RSS 2.0 feed. You can skip to the end and leave a response. Pinging is currently not allowed.